Zostava AFC: Manuel Almuni, Phillipe Senderos, Gael Clichy (71 Mark Randall)? 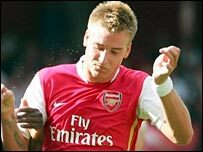 Kolo Toure (46 William Gallas), Bacary Sagna ( 46 Justin Hoyte), Denilson, Abou Diaby, Cesc Fabregas(46 Armand Traore), Mathieu Flamini (46 Emmanuel Eboue), Robin Van Persie (46 Alex Hleb), Nicklas Bendtner. Hráči ktorí do hry nezasiahli: Lukasz Fabianski, Nacer Barazite, Kieran Gibbs, Henri Lansbury, Rhys Murphy. Zostava PSG: Mickael Landreau, Zoumana Camara, Youssuf Mulumbu(74. Granddi Ngoyi), Pierre-Alain Frau, Sylvain Armand, Sammy Traore, Jeremy Clement, Didier Digard, Peguy Luyidula, Jerome Rothen, Pauleta. Hráči, ktorí nezasiahli do hry: Jerome Alonzo, Bernard Mendy, Mario Yepes, Gregory Bourillon, Mamadou Sakho, David Ngog, Amara Diane, Loris Arnaud, Marcello Gallardo, Younousse Sankhare.